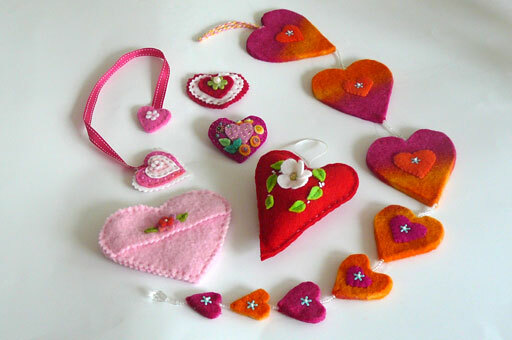 Valentine’s day was the first session of a six week hand stitching class for eight to ten year old girls. Mia, who coordinates a craft group for parents at Silkwood School, was the driving force to set up this class and provide a venue. I was humbled and thrilled to be asked to teach. Starting on a day that celebrates love seemed very appropriate as we hope to enable the children to find love for creativity, for their imagination, and for learning new skills. Above all the desire is that they can confidently make choices and feel good about those, discovering a love for for the work they create and for themselves. 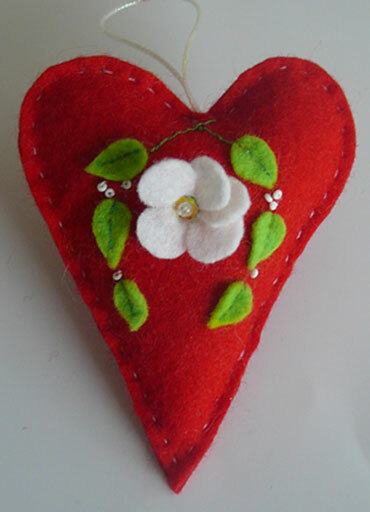 The first project that I devised had a heart theme, reflecting the day and aims.This item taught running, or dolphin stitch as well as a simple way to make a flower by stringing petals together. The sachet was filled it with lavender, scented wool. It was thrilling to see the children change the pattern to suit their ideas. 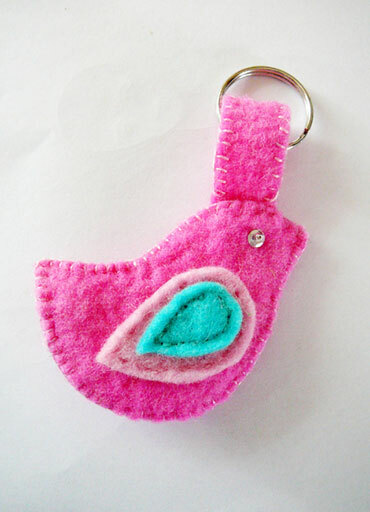 Little birds that could be used as bag or key tag came next and were designed to introduce and practice blanket stitch. The pattern was free cut from scrap felt. The emphasis of these projects is to make useful items that are not only functional and fun to do but also beautiful. Each week the aim is to introduce (and revise) one or two new stitches giving techniques and developing manual dexterity. Felt was chosen as a medium because it is easy to manage and manipulate, does not fray, feels good in the hand and comes in so many different colours. For the third session two different hair accessories were created. The first one was a hair clip featuring a rolled rose made from a circle which is simply cut into a spiral and rolled up. 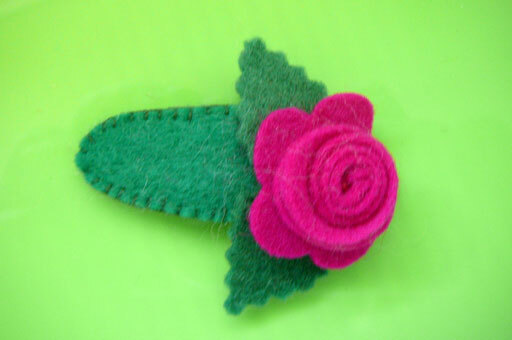 You can also make this type of rose by rolling up a strip of fabric or felt. There are instructions for a similar rose on Purl Bee that has scalloped edges. If you surf the net there are many tutorials for making all kinds of flowers. Many of the instructions you will come across will suggest gluing the pieces, however, my preference is to stitch. The girls managed this rolling and stitching process quite well. They were shown how to trace around the clip to make a base to cover the clip and attach the rose. Not your ordinary bobby pin. 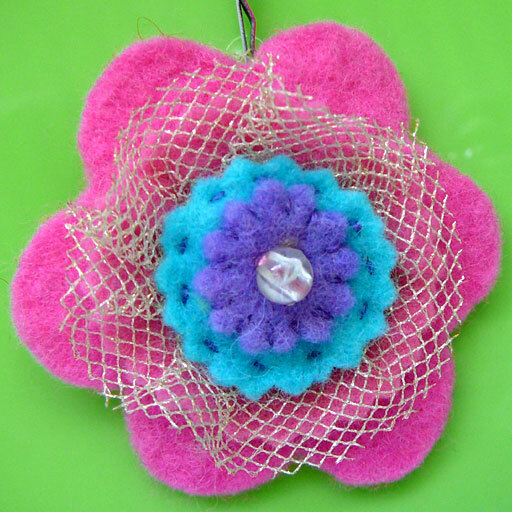 Our second project in this class was to decorate a bobby pin, or create a brooch, using simple flower shapes and circles. For the brooch version of this item we used a small safety pin though most preferred attaching a bobby pin.This project also gave an opportunity for experimenting with colour. The children were given the option to add a piece of gathered tulle as another stitch technique. Gathering was well liked as a process. Different methods of using the tulle such as folding, and double layering were shown for achieving different effects. This has been a wonderful learning experience for all of us.